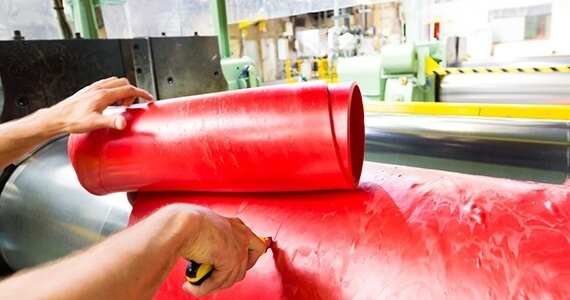 Chlorosulphonated Polyethylene or CSM – also known as Hypalon® – is to be considered an improved chloroprene as it offers better chemical resistance, ozone and light resistance, heat ageing. Their particular resistance to weathering conditions and the excellent low gas permeability presents CSM as the best option for the manufacture of premium quality inflatable boats and structures for all environments, but most of all in sea environment. With low fuel resistance, CSM is not meant to made bladders or any product in long contact with oils. However, due to its high environment resistance it was widely used in the manufacturing of bellows for trains and buses. Nonetheless, since the regulations evolved, now it hardly arrives to the standards of fire resistance and smoke on fire liberation. Most common applications: Ribs for inflatable boats. Inflatable sea or land structures, bellows for transportation systems, seals, etc.